The Belt worn on parade by Officers of the Ottoman army was also sometimes worn by German officers serving within the Ottoman Empire. The Ottoman belt was based on the original German design (see German Belt Buckles Page) in that it is made of woven metallic thread with a piping colour and held with a clasp buckle bearing the national symbol. Indeed the belts themselves were often made in Germany. 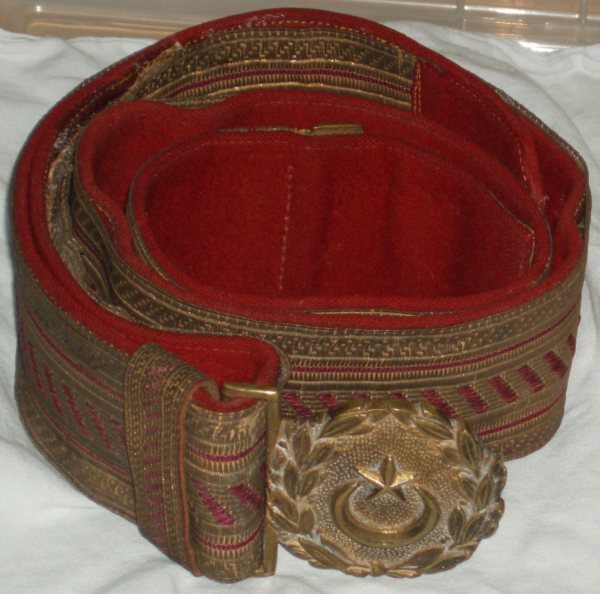 In the case of the Ottoman army this belt is made of woven yellow metallic thread with red backing and embroidery. The clasp is of yellow metal bearing a five pointed star above a crescent surrounded by laurel leaves. Please respect Chris Flaherty's generosity in sharing this image with us by not reproducing them without prior permission. Please contact me here if you have more information or photos on this topic.